Spring has sprung! I'm off to a slow start this season. Other commitments have kept me busy this spring, so I have not made my annual spring dredging trip this year. The short window of opportunity for low, clear water has already passed as water levels rise with the temperatures. It has been a rather cool spring in Southcentral Alaska, and as a result the snow is staying a little later than usual this year. My first trip to Crow Creek Mine just prior to the Memorial Day holiday revealed snow patches along the creek still. The mine is open for business, however, and many of the local miners were at the mine as I surveyed the area. I had left my little 4" subsurface dredge down in the canyon in the fall, hoping to use it early in the spring before the water came up. Since that time has passed, my first order of business was to get the dredge out of the canyon before the water gets any higher. I waited too long to haul out last spring, and the water rose to the point I could not ford the stream safely while carrying gear. I had to scale the canyon walls up a much less pleasant exit route, and did not want to repeat the experience this year. I've also taken a change of direction in my future mining plans. I've spent quite a few years mining the same locations, and want to start prospecting new areas. In particular, I want to spend more time metal detecting, looking for "the big one" so to speak. I've downsized my dredging equipment for now, having sold my 6" dredge last summer, and my 5" earlier this spring. I plan to upgrade my 4" subsurface with a better set of floats and a longer recovery box, and use it as my main unit for the time being. I won't be moving the volume, and so will take a hit in overall production. I'm hoping to stay more mobile and try and target a little larger gold than the quantities of smaller gold I have been getting. I guess I'm willing to trade quality for quantity for now. We'll see how this pays off. At the very least, I'll have new spots to write about for this Journal! I climbed on down to where I left my dredge last fall. I've learned from past experience that deep snow can really bury a dredge, so I try to leave them upright against a rock face or under a tree. This is not a problem now, since the snow is about gone. The dredge was fine, and the water conditions nice, so I decided to do a little dredging as I hauled the unit upstream. I set up where Darryl, Juli, and I had done a little sluicing last fall. The location was at the water's edge, and will be under two to three feet of fast moving water within a few weeks. It is the edge of a paystreak I had bypassed a few years ago, and from the sluicing we did last fall I figured I could pick up a little gold with no effort. Check my June 24th Journal entry from last summer if you are unfamiliar with subsurface dredges. The recovery system is underwater, which lowers the horsepower requirements, which in turn allows for smaller floats. My little 4" dredge only weighs about 90 pounds. I can pack it in two loads. Frames, floats, and sluice in one load, 4HP Honda and hoses in another load. Ideal for sites such as this. The downside is greater loss rates for fine and flaky gold, but they are not as bad as some people think. I have had so much interest in these units that I am writing a magazine article up on them at this time. I worked behind a large rock along the edge of a gravel bar, or should I call it a rock bar? Not much gravel in this canyon! After an hour or a little more I cleaned up, and found I had just over 2 pennyweights of small gold, or just over a tenth of an ounce. At that rate, I could have easily got about a half ounce by the end of the day. The problem, again, was that the water was coming up as the sun rose in the sky, and I still needed to get the dredge out. I decided to bite the bullet and pack it out. Besides, I had brought my metal detector along, and wanted to do a little nugget detecting before the day was out. It only took about two hours to pack the dredge out, thanks to the lightweight design. It was a far cry from packing the old larger dredges out. I still had some time left, so as planned I grabbed my metal detector and headed up the creek. I scouted around the exposed areas from the previous summer, but only found some surface trash. It is getting very difficult to find gold at Crow Creek by just swinging your detector. It has been hit hard by a lot of people with metal detectors. 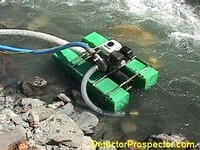 The best way to get any gold with a detector at this point is to move some dirt around. One nice thing about early spring is that you can see ground features that will be obscured by brush and leaves later in the season. I saw a little ridge back in the brush along a gully about 500 feet from the creek that looked interesting. The area had been stripped clean with hydraulic water cannons years before. Sometimes a lot of gold was left right on the surface, but now a thick layer of leaves covers the ground. The layer is thin on banks, and I like to scrape the thin covering off to get at the old wash layer below. The slope of the bank helps when pulling the leaves and surface material down the hill. I cleared the side of the gully a bit, and was immediately rewarded with a couple small signals from the Gold Bug 2. I was using the 6" accessory coil, which is very hot on small gold. The nuggets were small, only about a grain each, but it was gold! I continued to work the site, but the gold was small, and on the surface only. Leftovers from the old washing operations. I moved to another location farther up the hill where someone had dug under a tree. I got another signal in the back of the hole, and turned up another small nugget. One more scoop and the last guy would have got it. I cleaned up the hole and enlarged it a little, but only turned up a few more small nuggets. The day was wearing out, and the sun going behind the hill. The mosquitoes started to get more active, and I had put in a long day, so I decided to head on home. I ended up with 15 little nuggets using the detector. They ranged from .5 grain to 1.5 grain and totaled a half pennyweight. Along with the dredge gold, I had 2.5 pennyweights for the day, and had my dredge out of the canyon. Not a bad start for the season, and all of summer is ahead!